Pearland is a fast-growing suburban city located just south of the Beltway 8. One of the Bayou City’s close-in cities, Pearland is best known for its affordable housing options. Pearland is home to a number of gated and “special” communities as well as master-planned neighborhoods like Southern Trails, Lakes of Highland Glen, Shadow Creek Ranch, and Southdown. The city’s location along major freeways, Sam Houston Parkway (Beltway 8) and the South Freeway, provides Pearland homes with easy access to key Houston like Downtown, the Medical Center, and the Museum District. The Pearland Town Center and the Shadow Creek Ranch Town Center provide Pearland homes with plenty of retail and entertainment options. Pearland also has plenty of parks within its borders, with facilities for sports and outdoor activities. The Recreation Center and Natatorium offers swimming, circuit training, and fitness classes, among others. Pearland homes for sale are zoned to several school districts, including Pearland, Alvin,and Fort Bend. The majority of students are served by Pearland ISD schools. Laid-back and serene, Pearland is an ideal option for homebuyers who want affordable homes within minutes of Houston’s major job centers. Single-family homes are Pearland’s main housing attraction. Lot sizes range from 6,000 to more than 10,000 square feet. Prices for Pearland homes for sale start at $150,000 and can go for more than $400,000. 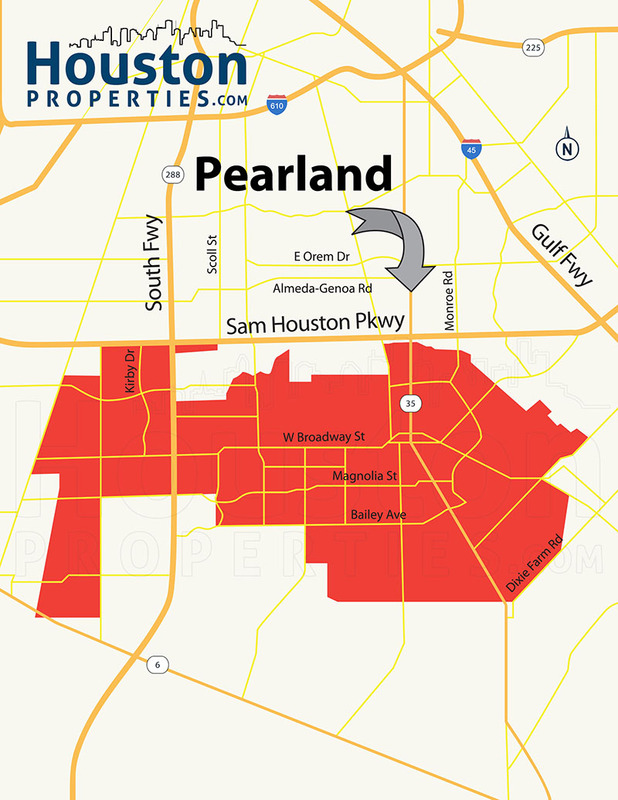 A sprawling 47.5-square mile independent city, Pearland is located along the Beltway 8. Bisected by South Freeway and minutes away from Gulf Freeway, the city has excellent access to Houston’s neighborhoods and key centers. Often described as family-friendly and laid-back, Pearland is a popular option among families and professionals alike. Pearland homes are centrally located near schools, shopping centers, and parks. Though largely residential, the community has a number of retail, entertainment and dining options within its borders. About 20 miles south of Downtown Houston, the area now known as Pearland had a lot of fruit trees. Witold von Zychlinski, a Polish noble, filed the plat for “Pear Land” after seeing the abundance of pear trees in the area. The neighborhood’s development picked up speed during the 1990s, and has grown at a fast-pace eversince. 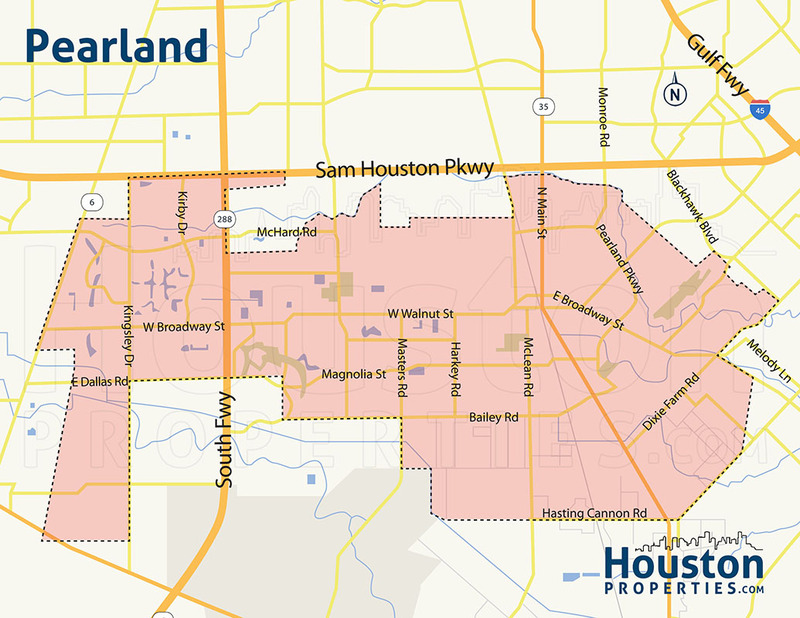 Today, Pearland is home to a number of neighborhoods, subdivisions, and gated communities. As an independent city, Pearland operates its own police and fire departments and has a council-manager type of government. Pearland homes for sale are mostly single-detached dwellings on large lots. Architectural styles vary, though traditional is a popular design. Zoned to several school districts, most Pearland residents attend Pearland ISD schools, while others are under Alvin, Fort Bend, Pasadena, Clear Lake, and Houston ISDs. Paige works with a tremendous number of buyers and sellers within Pearland.